…yes and no. It’s by no means the deepest genre entry ever, although that does not mean there is no fun to be had, flying that little ol’ space fish ship thingie, blasting everything in sight. That said, much like most old arcade games, Death Ray Manta SE is void of anything remotely resembling a story or a save feature, everything resetting the moment you get a game over. Which happens after dying once, I might add, so don’t go in, expecting to actually finish this one right off the bat. Practice, perfect, and so on. Oh, and… at first, one might think that collecting gems – which, far as I can tell, disappear rather quickly – serves some purpose or other, bringing about upgrades perhaps. Nope. They only add to your score, shown in the upper right corner. That’s all. And yet I still went for them, dodging green, orange, cyan and enemies of the oddest designs, in a mad dash to pick up that one gem in each level… often dying before reaching it, too. Darn it. Unfortunately, that’s pretty much all there is to it: collect gems while blasting everything that moves and avoiding collisions, and maybe, just maybe, you’ll get to see reach the next level. Then at some point you’ll die, at which point the cycle will repeat itself. While this can get rather repetitive, in short bursts, Death Ray Manta SE – in spite of its age clearly showing – can bring about a fun time. Provided one can handle the flashing colors and rather odd announcer, that is. So, long live the migthy space fish? 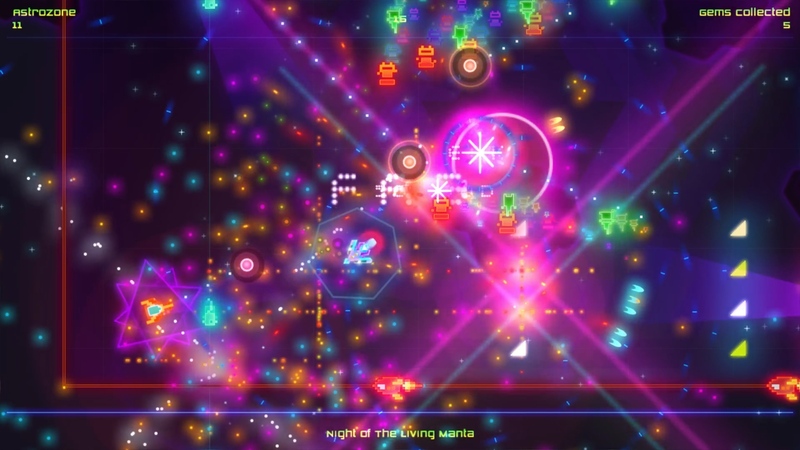 Death Ray Manta SE is available on Steam, carrying a $1.99 price tag.